Here is a review by way of quotation. I think it’s fair to say that The Big Sleep was the novelistic progenitor of noir, and established a tough-edged and metaphor heavy voice as the de facto narrative tone of the hardboiled genre. It’s also a book that has got by on its style rather than its substance: but that’s not the backhanded compliment it sounds, because Chandler was a master of style. The novel has some depth (there’s a fixation with opening and closing doors that’s both visually interesting and metaphorically loaded: an opened door can be a scintillating invitation or an act of trespass and violence; in Chandler’s mind, both at once. Plus some protagonists are now firmly established genre archetypes, and it’s always nice to know where these things come from); but, let’s be honest, I read The Big Sleep to earn literary cool points – The Big Sleep being the academically acceptable face of pulp fiction. Her calves were beautiful, the ankles long and slim and with enough melodic line for a tone poem. She was as limp as a fresh killed rabbit. ‘She ain’t here.’ The voice was as stiff as a breadstick. His glass eye shone brightly up at me, and was by far the most lifelike thing about him. He sounded like a man who had slept well, and didn’t owe too much money. Geiger was living with the punk I got outside in my car. I mean living with him, if you get the idea. It was raining hard. Again. I walked into it with the heavy drops slapping my face. When one of them touched my tongue I knew that my mouth was open and the ache at the side of my jaws told me it was open wide and strained back, mimicking the rictus of death carved upon the face of Harry Jones. 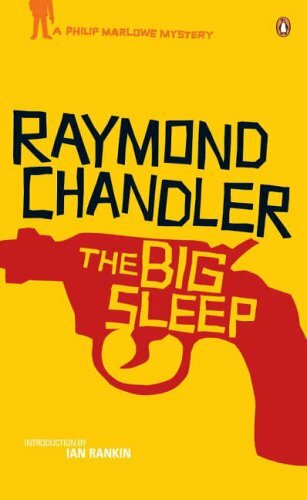 This entry was posted in Novels, Reviews and tagged Raymond Chandler, The Big Sleep. Bookmark the permalink. I really like your “review by way of quotation” idea. “The Big Sleep” sounds like a book I’ll have to pick up one of these days. The Big Sleep is great: I recommend it. I like: ‘They’re very swell legs and it’s a pleasure to make their acquaintance’. “Dead bodies are heavier than broken hearts” is still my favourite, I think.